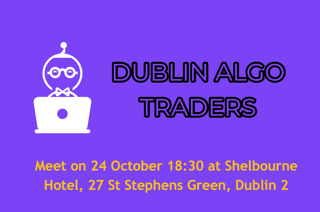 With London being the central hub for algorithmic traders, we want to show that Dublin has plenty of opportunities for algo traders. People will learn about what do bots actually do, how to trade with bots and what is the future of trading. Ivo Luhse from DARA TRADE about building successful algorithms and the future of trading bots. We will also be having a practical session presented by FXCM on free APIs and algo trading resources. How can people book tickets?